BD: You could say that MixPixie is a kind of Moonpig for music. Catchy! And how did you come up with the idea? I received an anonymous CD about three years ago, addressed to someone called Sarah. It was a Valentine's gift with handwritten tracks and beautiful handmade packaging. I tried to find the Sarah it was meant for - asked in my building, down the street but no one knew who she was. So I held on to it. I was really touched by the work that had gone into the CD. I was working for a really big record company at the time, churning out those compilation CDs that get flogged at the supermarket. I thought it was a real shame that people would like maybe three tracks on these things; they weren't catering to the consumer properly. You should be able to create your own compilations, with only the music that you want. So, the next night, I met up with Adam Goodyer and James Perkins from ConcertLive and took the CD with me. We talked about setting up a company that let you choose the tracks, the packaging and the words on the album. And that's how it started. This sounds like a licensing nightmare. How did you get the record companies to agree? Well, I'd worked in the music industry for ten years at many of the major labels. Adam and James were incredibly experienced in the licensing game through ConcertLive, so we approached all our contacts and said: 'This is our idea. Are we bonkers? Would you support us?' They said yes. Don't get me wrong, after the initial agreement, the thing went over to the lawyers. Each deal took up to a year to sign off. We have one that is still pending. But we've got eight million tracks on the site now, so we're doing pretty well. So what does the product look like, and how much does it cost? When you land on the MixPixie homepage, you can pick a design and album theme according to the occasion: birthday, Mother's Day or an engagement, for example. You can edit all the text, personalise the inside and a third of the designs let you upload your own image. Then you pick up to ten songs to go on the actual CD. It costs £5.99 for a single track CD, and up to £14.99 for a ten-track. Each song is priced like a music download at 99p and the packaging is set at £5 to keep it simple. Can you get decent margins at that price? 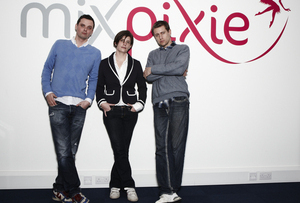 Until people use Mixpixie on a regular basis, we want to be as accessible, in terms of price and product, as we can be. Most people are used to paying between £10-£15 for 10-40 track CD. My concern about introducing higher prices was that people would instantly compare MixPixie with generic CDs, regardless of the personalised differences. I didn't want to price ourselves out of the market. This is the time to build brand and customer base, not make vast sums. Do you outsource the manufacturing? How do you fulfil all these bespoke orders? We had to buy our own machines to press the CDs. No one else can do this. Normally, if a record company is getting CDs made – all the UK ones are made in Germany these days, incidentally - they press a button and 100,000 copies come out in a few hours. We needed something that would do one at a time. Also, we had to think very hard about the actual cases. Plastic jewel cases often crack in the post and they don't feel particularly high quality. Instead of plastic, we use digipaks, which is a kind of reinforced cardboard. They really have that 'wow' factor. It was incredibly time-consuming and expensive getting all the machines and making sure they could talk to each other, but it gives us complete control. Even if we could have found printers, we didn’t want to be stuck in long print queues, shunted behind a larger order. We pride ourselves on fast turnarounds: all orders are dispatched within 48 hours. I didn’t quit my job till June last year, so I still had my salary to live on. To buy the machines, we went to various private equity backers. It was much easier than I thought it would be. It's all about who you know! We raised £500,000 in seed capital. Don't you worry about copycats? I have heard rumours that other people want to do what we’re doing but the amount of investment required and the complex relationships with record companies are a real barrier to entry for any new players. We’re first to market and that puts us in a really good place. But, to be on the safe side, we did look into patenting the technology but were advised that it was a no go. For now though, I don't want to worry about what everybody else is doing, I want to concentrate on what we're doing. And what's the smartest thing you've done so far? We did a partnership with Westlife just before Christmas. It was exclusive to us and went down a storm with the fans. Basically, we used our technology to let people buy personalised versions of Westlife's Greatest Hits album. It was signed 'from Kian, Nicky, Mark, and Shane', and you could put photos in there, change the text, the works. It was an incredible way to launch the company, which went live to the public in February. We manufacture our CDs in Guernsey. We chose there for a few reasons: the place has a really good fulfillment history, really experienced staff, and you didn't have to pay VAT on exported products. I knew that was going to change at some poiont but I had no way of knowing when. So, we moved over there and, in December, they changed the VAT law. As of April 1, we had to pay VAT. That was a crunch moment. But we haven’t put our prices up, we’re absorbing it on our margins. What are your projected figures for the first year? We hope to do 75,000 units this year which is very achievable. But this is a volumes game. Once we get a larger customer base, then margins really start to grow. We also have to renegotiate our deals with the record companies every year, which will be interesting. They took a gamble on us at the start but once we've proved that we're representing their artists in the best possible way, the terms should get better and better. And finally, did you ever track down the Sarah whose Valentine started the whole thing? I never did. We still have the CD though. It sits in pride of place in our loo! We'd love to find her though.